Streamline order flow and production execution, track the transformation of products from raw materials to finished goods, and evaluate and analyse yield, quality, and plant resource utilization. Improve operational efficiencies by reducing production costs and losses with visibility into manufacturing execution. A model-driven MES approach enables standardization of operational processes, equipment, and activities for faster gains in productivity, quality, and cost savings in multi-site operations. Digital manufacturing execution reduces production costs by increasing throughput, reducing scrap and rework and providing higher quality products. Increased transparency in order fulfillment and reduced variance in product quality increases customer satisfaction while increased responsiveness to unforeseen events or product quarantine/recalls secures brand equity and consumer safety. 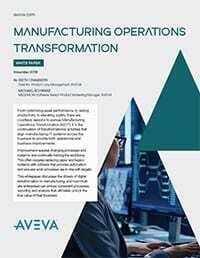 Operations – Digitize and standardize work order execution processes, enforce product build to specification and capture manufacturing execution and material flow information in real time. Performance – Monitor, analyze and continuously improving operating efficiencies through production and equipment event tracking with work order execution progress information. Quality – Automate quality operations and sample plan execution, providing visibility into trends and rule-violation notifications to effectively reduce quality losses, minimize variation and improve yields. Transform production and inventory operations by digitally managing the business rules and capturing information about the “Who, What, When, Where, Why and How Much” in batch and hybrid production processes. 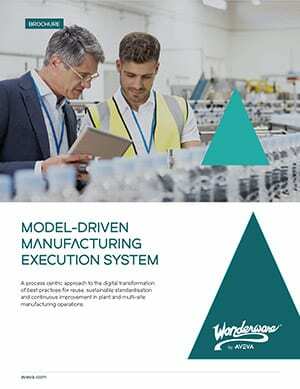 The manufacturing execution system provides the tools to manage and monitor work order execution, enforce products build to specification and document all manufacturing execution detail and material flow in real time on the shop floor. Digital manufacturing operations management helps to increase the efficiency and flexibility of manufacturing processes, and reduces the cost of compliance and consumer safety risks. With reliable, real-time information managers and operators are better equipped to streamline order flow and production execution, quickly track the transformation of products from raw materials through finished goods and evaluate yield, quality and resource utilization for continuous improvement. Manufacturing performance management helps keep equipment operating at peak performance and provides the edge to reduce margins, cut costs, and compete at a higher level. Real-time visibility helps identify the weakest links in your lines and use overall equipment effectiveness (OEE) KPI monitoring to manage them back to full operating potential. 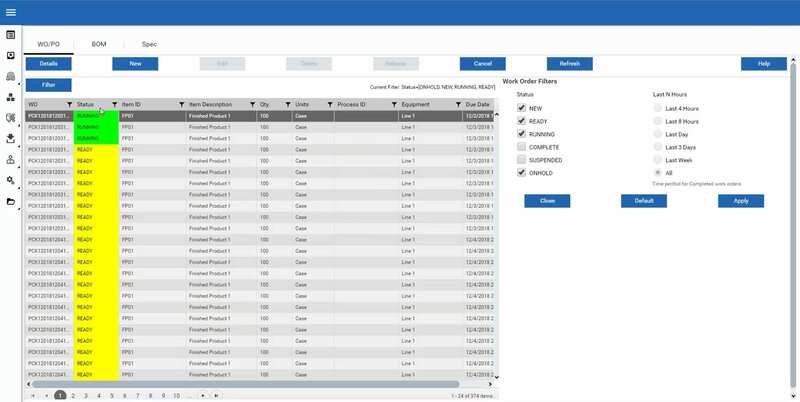 Tracking of work order execution enables you to categorize unplanned downtime vs. product changeover, idle time, or other planned events. Such granularity at the work order level feeds OEE KPI calculations with dynamic performance target adjustments based on different products, and enables real-time indication of schedule adherence and actual line performance. Integration with the plant control system supports performance management by capturing production data and short stoppage events. This frees line operators from manual data collection while also providing actionable information to increase operating performance and efficiency. Digital quality operations management provides everything you need to marshal your equipment, your procedures, and your people around a mission to maintain and continuously improve production quality. Execute quality sample plans with complete functionality for both automated and manual data collection and alignment with work order execution events. Integration with plant automation systems provides effective quality control and SPC visualization for fast moving goods manufacturing. Integration with workflow management software helps to automate manual data collection processes and procedures for corrective or preventive measures, reducing the time to action. Production Management – digital information and rules management for work order dispatching and tracking for any combination of manual or automated equipment job execution. Inventory Operations Management – real time tracking of materials, semi-finished and finished products including receiving, transfers or for managing Kanban inventory as materials are consumed and products are made. Bill of Material and Recipe Management – Quality losses can be minimized and consistency improved through enforcement of product and process specifications. Track and Trace – Reduce the cost of regulatory compliance and protect brand equity with automatic electronic record keeping for detailed product genealogy and end to end material traceability in minutes. Enterprise Integration – Using Enterprise Integrator with Enterprise Resource Planning enables agile, short-term production management and provides schedule flexibility and adoption for the plant as well as supply chain visibility into operations and inventory. Quality Operations – Automate and enforce quality inspection and data collection procedures in alignment with the real-time status of work order and job execution, and in response to shop floor events for reducing giveaway and variance in production results. Plant Performance Management – Unlock more value and capacity from existing assets with visibility into line and plant equipment utilization and Overall Equipment Effectiveness (OEE) KPI’s. Digital Workflow Management – Automate operational activity and data collection processes, eliminating paperwork and manual error-prone procedures.